As beautiful as the horses it features, and as uncompromising as the broken men it depicts, “The Mustang” is a modern tale that celebrates and then deconstructs the old ideas of the West. 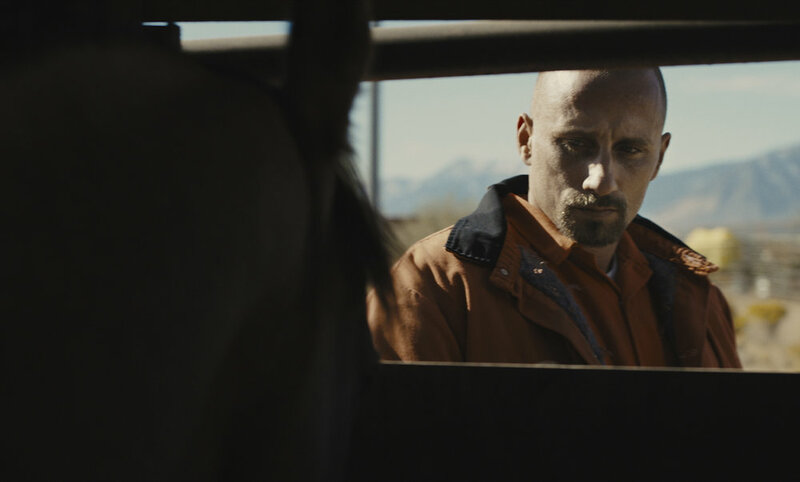 In the state penitentiary in Nevada, an island of barbed wire and walls in the middle fo the desert, Roman Coleman (Matthias Schoenaerts) is a man alone. Recently released from isolation, he tells the prison psychologist (Connie Britton) “I’m not good around people.” So she recommends he be assigned to outdoor duty, shoveling manure in the horse yards adjoining the prison. In those horse pens is the prison’s one source of pride: A wild horse rehabilitation program, which takes mustangs captured by the Bureau of Land Management for population control and tries to train them to be auctioned as police horses and other equine jobs. Inmates who obey the rules and can handle the horses, and handle the program’s grizzled old boss, Myles (Bruce Dern), are allowed into the program. Roman notices one horse, locked in a barn and trying to kick its way out. Myles tells Roman the horse is too wild, and only a fool would try to tame it. But Roman gives it a try, initially with disastrous results. But Roman tries again, seeing in this horse, whom he names Marquis, a kindred spirit, a creature enraged by captivity but with the potential to grow beyond it. French actor Laure de Clermont-Tonnerre, making her feature debut as writer and director, provides other obstacles to Roman’s already rocky road to redemption. There’s Marsha (“Blockers’ “ Gideon Adlon), Roman’s pregnant teen daughter, who hasn’t seen her father free since she was a little girl. And his cellmate, Dan (Josh Stewart), a gang leader with connections beyond the prison walls, threatens harm to Marsha if Roman doesn’t smuggle horse tranquilizer from Myles’ supply cabinet into the prison — something he has seen the program’s most talented trainer, Henry (Jason Mitchell), do a few times. Schoenaerts is a Belgian actor who has been impressive in European films (a boxer in “Rust and Bone,” a steroid junkie in “Bullhead”) and Hollywood (as Jennifer Lawrence’s spy boss in “Red Sparrow,” and Jane Fonda’s son in “Our Souls at Night”), and here he’s powerfully good. He shows Roman, at first, as a rock, hard and silent, but his time in the training ring with his horse first causes him to unleash his anger and ultimately his fear — as he starts to confront the actions that put him in prison and the pain they caused himself and his daughter. Clermont-Tonnerre sets this story in the harsh, unforgiving landscape of Nevada, on the desert plains framed by distant mountains, a locale John Ford would have picked if he had seen it. It becomes a spare, elegiac backdrop for Roman to let his macho facade crumble and allow a new self to emerge. Opened March 15 in select cities; opens Friday, March 29, at the Broadway Centre Cinemas (Salt Lake City), Century 16 (South Salt Lake City) and Megaplex Jordan Commons (Sandy). Running time: 96 minutes.